35Cl 7577% 35Cl is stable with 18 neutrons. 37Cl 24.23% 37Cl is stable with 20 neutrons. Chlorine is a chemical element that has the atomic number 17, and the symbol Cl. There is an abundance of chlorine in nature since it is found in common salt as one of the two elements making up sodium chloride. 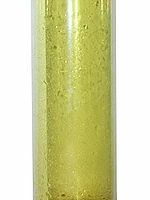 When chlorine is in the form of a gas, its color becomes greenish yellow, and its weight is more than twice that of air. Chlorine gas has a suffocating odor and is very poisonous to every living thing. It is perhaps best known for its powerful disinfecting activity as an element and in the form of hypochlorite. Chlorine is usually found combined in nature because of its reactivity, as a gas each molecule has two atoms of chlorine. Since sodium is very desirable for making washing soda, Chlorine was available in large quantities cheaply, and its chemistry was thoroughly explored. Chlorine gases are made up of diatomic molecules, as the formula Cl2. The gas can be smelled in the air at 3 parts per million(ppm), and is irritating to the nose, mouth, and lungs. It causes throat irritation at 15 ppm, coughing at 30 ppm, and causes deadly effects after a few deep breaths at 1,000 ppm. Chlorine gas is easy to dissolve in water, and chemical reactions occur that produce hydrochloric acid (HCl) and hypochlorous acid (HOCl), plus some unreacted Cl2. This is called chlorine water and it is used to kill germs in water or to bleach papers and fabrics. Chlorinated hydrocarbons have had some of their hydrogen atoms replaced by chlorine atoms. A variety of chlorinated hydrocarbons have been used as insecticides. One of the earliest to be used was DDT, dichlorodiphenyl-trichloroethane. However, it caused serious environmental problems, and it is not used as much as before in the United States. Other chlorinated hydrocarbons are used as pesticides in the farms, but all of these compounds are very stable so they last a long time in the environment, and are becoming a serious problem. It is prepared commercially by passing electricity through a water solution of sodium chloride or through molten sodium chloride. The electrolysis of a water solution of sodium chloride is known as the chloralkali process. This process also makes sodium hydroxide, with hydrogen as a byproduct. Sometimes the chlorine and sodium hydroxide are mixed to make sodium hypochlorite, a common bleach. Chlorine can be made by reacting manganese dioxide with hydrochloric acid. Chlorine is abundant in the lithosphere, and it is estimated to be about 0.045%. Its strong chemical affinity for other elements means that it never occurs in the free state, except as a minor component of the gaseous output from volcanic eruptions. Chlorine is a compound of the most common minerals; rock salt or halite(NaCl), sylvite(KCl) and carnallite(MgCl12.KCl.6H20). Chlorine salts liquefy in the hydrosphere (oceans, lakes and rivers) instead of being spread out in the lithosphere (rocks and minerals). NaCl, sodium chloride, is the most common element of the alkali metals in the hydrosphere as well as in the lithosphere. Thus, it's named common salt. The average concentration in seawater is approximately 2,6%. Table salt plays an irreplaceable function in the human diet and the uneven distribution of its deposits over the earth's crust has played an important role in conditioning the pattern of civilization in time and space. 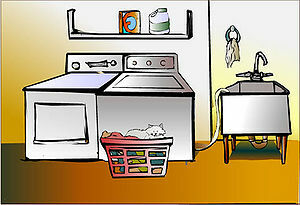 Bleach used in household cleaning contains chlorine. In 1774, Karl Wilhelm Scheele discovered Chlorine. Scheele thought that chlorine was an oxide of murium, or hydrochloric acid. Scheele experimented by heating manganese dioxide and hydrochloric acid. From this experiment he discovered a greenish, yellow gas, which was chlorine. However, Scheele did not consider chlorine as an element. In 1810, Humphrey Davy named chlorine and established it as an element. It was named after the Greek word chloros, which means pale green. Chlorine was first introduced as a weapon during the World War I by the Germans on April 22, 1915. The chlorine weapons failed because they were not prepared well, but some chlorine poisons are more dangerous than others. It is alleged that Haber's role in the use of chlorine as a deadly weapon drove his wife, Clara Immerwahr, to suicide. After its first use, chlorine was utilized by both sides as a chemical weapon, but it was soon replaced by the more deadly gases phosgene and mustard gas. The chloride ion is formed when the element chlorine picks up one electron to form an anion (negatively-charged ion) Cl−. Most of the salts of hydrochloric acid (chlorides) dissociate in water to release chloride ions. An example of a chloride is table salt, which is sodium chloride with the chemical formula NaCl. In water, it dissolves into Na+ and Cl− ions. The word chloride can also refer to a chemical compound in which one or more chlorine atoms are covalently bonded in the molecule. This means that chlorides can be either in inorganic or organic compounds. This page was last modified on 23 March 2011, at 16:43.